Our industrial heritage is typically perceived by chimneys and mills, engineering works, canals, bridges and railway stations. 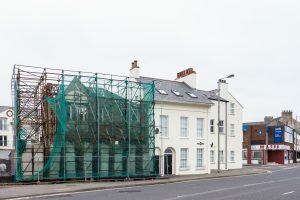 But perceptions can overlook smaller buildings associated with our industrial past in towns and villages that are synonymous with the leading commercial enterprises of Northern Ireland. The Kelly family’s ship owning and coal importation business is one such entity with its Belfast registered ships and the distinctive Kelly funnel; black with its red and blue bands and black ‘K’, well known in ports throughout the British Isles, Ireland and Western Europe. Founded in 1840 by Samuel Kelly the company was incorporated in 1911 by his son John, where the business prospered and expanded under his management. Acquisitions in the inter-war period included the coal importing business of Charles M Legg of Carrickfergus. 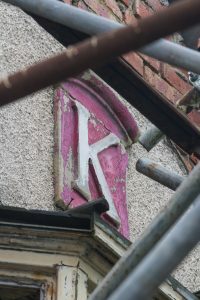 Extensive coal quays and yards and the distinctive ‘coal office’ now flew the ‘K’ adorned flag in the East Antrim port. John Kelly’s coal office in Carrickfergus sits prominently opposite the Castle, set back from the harbour, classified as ‘at risk’ for 21 years since it appeared in the Buildings at Risk Catalogue, Vol. 4, p17. 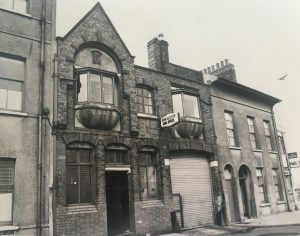 The office building was built in c.1910 featuring an asymmetrical red brick façade with stone facings around the openings and an oriel window on the first floor that presents a vital, if elaborate, Edwardian brick building according to Campbell and Cower (1975). The attention to detail in what could easily have been a very utilitarian building highlights the importance of coal importation in the 19th and 20th Century, particularly in towns like Carrickfergus with its historic harbour, which became one of John Kelly’s primary importing and distribution centres. The development of Carrick Marina and apartments forced the closure of the coal trade in the town and the coal office became a building without a purpose. It was reported to have been sold a number of years ago and appeared to be in relatively good condition at that time, with a number of potential proposals for reuse. However, unfortunately, none of the potential proposals came to fruition. The condition of Kelly’s Office has suffered greatly since being identified as at risk in 1997. The roof was removed allowing severe water ingress damage that was further exacerbated by vandalism. In 2014 the building was ‘wrapped’ in a vinyl representation of itself in the prosperous days when it was a working coal office. This £8m province wide government financed vinyl façade scheme designed, apparently, to improve the appearance of unloved heritage buildings, actually has served mainly to hide further deterioration to the fabric of at risk buildings as ‘out of sight, out of mind’. 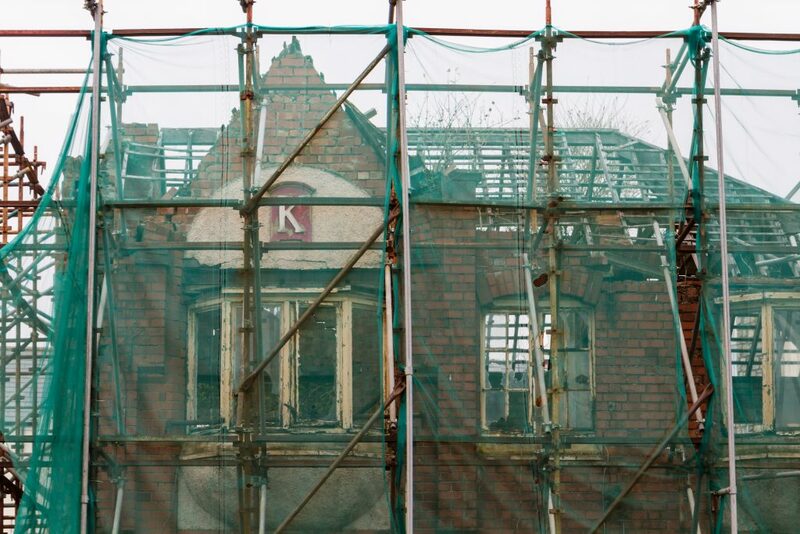 However, the future of this building, unlike many others treated to the same intervention, is now burning brightly with the advent of an enthusiastic new owner. Mr. Cobain acknowledges the difficulty of the conservation deficit when restoring historic buildings but highlights that the contribution to the soon-to-be restored building will outweigh the financial expense. Recognising that there is more to be gained from the restoration of our historic buildings than just financial return is a commended attitude. As the Carrickfergus Townscape Heritage Initiative supported by Heritage Lottery Funding develops, the benefits to the historic town of Carrickfergus and their heritage assets are set to increase which will surely stimulate and support wider economic regeneration by creating a quality environment for local residents and tourists to enjoy.